Centre for Solutions Journalism (CSJ) executive director Brian Ligomeka made the call in an interview on Monday when he commented on the repulsion of the harmful ‘8th Amendment’ from Ireland’s constitution. “Malawi as a nation needs to emulate what has happened in Ireland by reforming its abortion law. It is unacceptable for the state and religious denominations to be denying women access to sexual and reproductive health services and rights in the name of archaic laws, religion or culture,” he said. Ligomeka added: “It is pleasing to learn that women in Ireland will be able to access comprehensive sexual reproductive health services including safe abortions in their own country following the recent legal refoms,” he said. “Here in Malawi, the stories of women injuring themselves when desperately trying to induce abortions with crude objects and substances such as cassava sticks, bicycle spokes and poisonous concoctions are horrifying. In countries, where abortion is legal, few tablets of such drugs as misoprostol results in safe abortions. “Why should women and girls continue dying when procuring unsafe abortions yet our health workers have expertise to induce safe abortions, but are barred from doing because of archaic laws?” he quizzed. Ligomeka said sexual and reproductive rights are personal and private issues that individuals should make with the support of their doctors and loved ones, without the interference of the state and the clergy. “Let doctors be responsible for intervening in the physical health of the people while the clergy should concentrate on the spiritual health of the followers….Doctors should be saving lives including of women dying from unsafe abortions while the clergy should be nourishing the souls of their followers,” he said. While all its neighbours have reformed their abortion laws, poverty-ravaged Malawi which touts itself as a “God-fearing nation,” is stuck with restrictive abortion laws framed during colonial era in early 1900s. 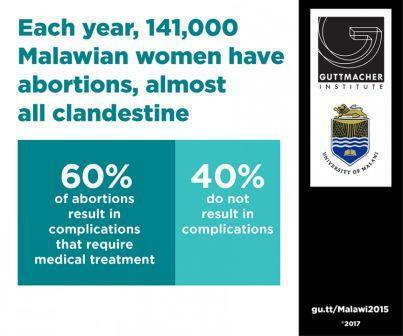 Despite having restrictive laws, over 141,000 women and girls in Malawi procure abortions using crude instruments that result in serious complications and deaths. Ministry of Health admits that unsafe abortion is a serious public health problem in Malawi which is responsible for 18 percent of maternal deaths. Several studies show that poor rural women are the ones who suffer from the brunt of unsafe abortions as those from middle and upper-class families seek an induced abortion from providers with a clinical background. Due to low contraceptive (family planning) rates in the southern African nation, many women and girls end up having unintended pregnancies. According to research by College of Medicine (University of Malawi ) and Guttmacher Institute, 886,200 pregnancies occurred in Malawi in 2015, and of those, 470,000 (about 53%) were unintended. Out of those unintended pregnancies, 30% ended in induced abortion. Meanwhile the Malawi Law Commission has drafted the Termination of Pregnancy Bill, which Centre for Solutions Journalism is actively campaigning for its enactment. “We want to ensure that the proposed Termination of Pregnancy Bill which the state-sponsored Law Commission framed is tabled in Parliament,” said Ligomeka. Many liberal religious leaders are in support of the proposed abortion law while few conservatives are still uncomfortable with it.